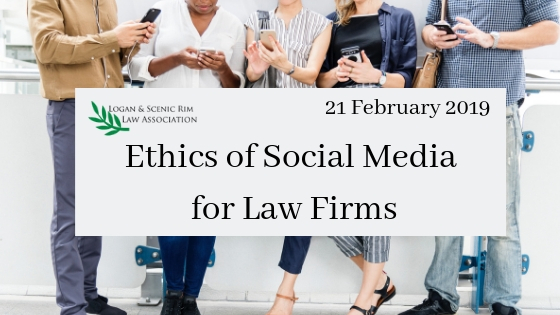 The Logan & Scenic Rim Law Association is proud to present a very worthwhile topic for the law firms of today; Ethics of Social Media for Law Firms. This is a FREE event for our members. We are pleased to have Les Power, legal practice director and head of litigation and dispute resolution at Wilson Lawyers, present for us on this topic. Les is a sought after presenter on ethics, property and commercial law, and professional responsibility topics for a range of conference producers, including Queensland Law Society and Legalwise. Les has more than 20 years in private practice and is an accredited specialist in commercial litigation. Having spent his early career as an articled clerk in Charters Towers and spending many more of his more recent years in the inner suburbs of Brisbane, Les has a unique understanding of the challenges of practice facing practitioners in both regions and the CBD. Known by his peers as their go-to ethics man, Les is a senior practitioner who prides himself in supporting and advocating for an ethical and well-regarded profession. The practice and business of law is a different place than it was 10 years ago, and 20 years before that. We are all marketing ourselves differently and through a platform that can be both exciting and treacherous. Come along to our Ethics event to learn more about how you can be engaging with social media platforms in the best way for your practice. This is also a great opportunity to network with your local legal community.